Even "sustainable" farmers seem to be addicted to plastic trash. From the pipes and tubes that deliver irrigation water to the pots seedlings are grown in to those delightfully tacky blue and orange bits of twine that bind bales of hay, plastic products are stitched into almost every agricultural activity. Agricultural films – thin plastic membranes used to cover the soil for purposes of weed suppression, temperature enhancement, fertilizer uptake and more – are one of the largest contributors to the billions of pounds of plastics that are discarded by farms across the planet each year. The use of these films has become so predominant in recent years that there is now a name for it: plasticulture. It’s a $5 billion-plus industry currently that is expected to nearly double by the end of the decade. Almost every household in North America recycles their bottles and cans these days, and many industries have either voluntarily initiated recycling programs to divert their waste products from the landfill or have been forced to do so by regulators. But what about agriculture? Many farmers are in the habit of either burying their plastic waste on-site or burning it – apparently the tipping fees charged by landfills for dumping solid waste are a budget item that some cash-strapped farmers prefer to do without. Most states now have laws prohibiting the burning of agricultural plastic, but taking it to the landfill is still not an environmentally-friendly alternative. Even organic farmers produce their share of plastic waste. The USDA organic standards do not specifically address the issue, and many practices endorsed by the sustainable agriculture community – such as irrigating with efficient but non-reusable ‘drip’ tape – result in huge piles of plastic trash around many organic farms. Whole Foods’ new Responsibly Grown rating system gives growers points for reducing their waste stream, but on the whole, the use of plastic products on farms is an extensive, growing, and largely accepted practice, even among sustainability advocates. With the increased use of agricultural plastics, specialized recycling enterprises have cropped up throughout the country in an effort to give a second life to the many disposable farm products. Some are government-subsidized programs based at local landfills, while other seek a market-based approach, turning ag plastic into everything from grocery bags to crude oil that can be refined for fuel. The use of agricultural films has become so predominant that there is now a name for it: plasticulture. It’s a $5 billion-plus industry currently that is expected to nearly double by the end of the decade. However, just as every first grader learns that it is better to use a non-disposable water bottle rather than recycle disposable plastic water bottles, it makes sense that farmers would want to tackle the problem from the supply side of the equation. Here are three of the most common disposable plastic products in the agriculture supply chain and ways that farmers are eliminating the need for their use. Ancient farmers ran water through earthen ditches to reach their crops, a practice that is still used in some countries (think the rice paddies of Southeast Asia), but in modern times irrigation without pipes and tubing is virtually unheard of. Unless, that is, you don’t irrigate at all. Dry farming – a catch-all phrase for farming techniques that use only the water that falls from the sky – is gaining momentum due to the extreme drought conditions in the western U.S. A side benefit is that plastic irrigation supplies are irrelevant. Farmers like David Little of The Little Organic Farm in Sonoma County, California, have mastered the craft of trapping moisture in the soil for the duration of the growing season so that irrigation is not necessary. The Center for Agroecology and Sustainable Food Systems at the University of California in Santa Cruz, one of the pioneering institutions in modern dry farming techniques, offers an apprenticeship program where students can learn the tricks of the trade. Covering the soil around crops with plastic accomplishes many goals at once – weeds are suppressed, the soil is warmed, fertilizer applied below the plastic does not run off in the rain, and soft fruits like strawberries are kept out of contact with the soil where rot-causing fungal spores dwell. The old-fashioned version of plastic mulch, of course, is all-natural biodegradable mulch like straw, leaves, wood chips, and other types or organic matter. The idea behind plastic mulch is that is more efficient to install on a large scale (on large farms it is applied with special machinery) and thus more economically feasible. However, there are many examples of financially viable modern day farms that use organic materials rather than plastic mulches. Recently, the Rodale Institute, one of the pioneers of organic agriculture, did an in-depth study on the benefits of using mulch from cover crops. These soil-enriching crops may be grown over the winter in the same beds where a food crop is to be planted the following spring and used in place as mulch. The Rodale Institute has developed an automated method of cover crop mulching involving a special “roller-crimper” device, which they’ve outlined in a 24-page booklet. Some crops are planted directly in the ground by seed, but many start their life inside a tray of plastic pots in a greenhouse. 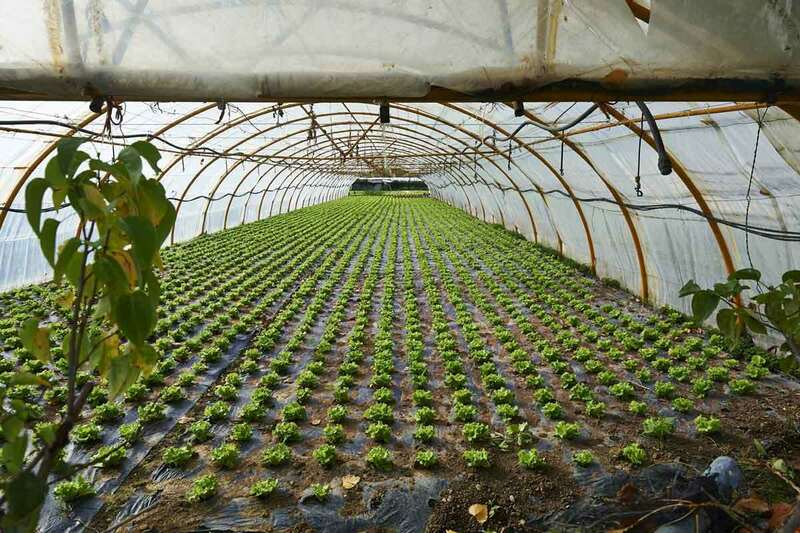 Plastic pots are reusable to an extent, but most seedling trays used for vegetable production last two or three years at best before they are carted to a landfill. However, Japanese farmers have developed a transplanting system based on inexpensive, biodegradable paper pots. Rather than removing each seedling from its pot, the paper pots are planted directly using a non-motorized device that can be pushed like a lawnmower or pulled behind a horse or tractor. The system works on a small scale but it is economically viable for large growers as well – one person can plant 264 seedlings in less than a minute without any bending over or digging. The system was previously available only in Japan but is now being distributed by Small Farm Works in Wisconsin. For every 1 way farmers are using less plastic, there are 10 ways they are using more! Every time someone invents a new gadget it is invariably plastic, and then consumers want what farmers are using and the plastic problem escalates further. Farmers are addicted to plastic so they can maximise profits and until we stop living in a capitalist society, farmers will not change.